Honey bees' foraging preferences can provide valuable information for governments about how to better manage rural landscapes, according to new research. But a study published in the journal Current Biology has revealed that a honey bee's waggle dance, in which it waggles its abdomen while moving in a figure-of-eight pattern to tell its nest mates where to find good sources of pollen and nectar, identifies the better areas as being in rural lands under a higher level AES rather than any other land type, including urban areas and rural lands not under AES. By combining the waggle dance data with maps of land use, the researchers could make a landscape-wide survey of the surrounding 94sq km (36sq miles) because honey bees forage at long distances from their hives. The landscape was divided into one of seven land types – urban, rural, and five types of rural under government-funded AESs, a university spokeswoman said. "Another approach is to make existing areas more wildlife-friendly, like the agri-environment schemes. Here we have let the bees tell us which practices and what areas are good for them. 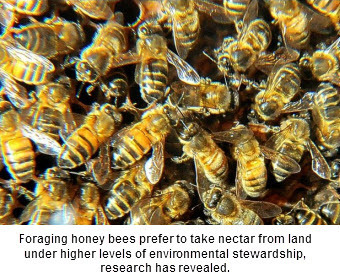 "The honey bee is acting as an 'indicator' species pointing to 'healthy landscapes'. The honey bee is a generalist forager, so landscapes used by honey bees are good for a wide range of pollinators. "The waggle dance is, therefore, more than just behaviour. It is a powerful tool for ecology and conservation."